Half the battle of investing is finding the right stock. There are thousands of listed stocks, but some are (much) better than others. How can you find the right ones? One way is to glean large amounts of data from the net and parse it yourself. If you have the know-how and time, this is a good way to have up-to-the-minute data. That’s useful for short-term day trading on technical trends. Even up-to-the-day data is useful for us. As a part-time programmer, I want to discuss it at least a little. Hence, I will append a short discussion on automating Excel at the end for those interested. For most of us, however, we just want to find some good value or growth stocks – that means a long-term outlook, and our fundamentals won’t be changing as rapidly as the technicals. We can thus go with a more traditional approach: stock screeners. There are several freely available ones that even the first-time investor can break into. We’ll cover Yahoo’s, Google’s, and Finviz as our main screeners. We will touch on two newcomers, too: Stockflare and Stockopedia. However, these are not the only screeners and the rules below apply to them all. What we are showing you below is the bottom-up approach to investing, but you could also look at the top down approach of investment where you first look at the macro factors and then identify stocks to research. A screener is a simple tool that queries a database of listed stocks and returns the ones that match your criteria. The most basic one may just search for current price, a number of shares, market capitalization, and volume. Others will let you drill down much deeper, filtering out companies based on Average Days Payable Outstanding and a Net Debt to EBIDTA ratio. Yahoo offers nearly 100 different criteria on which you can search. Proprietary screeners may offer many more and also check current technical trends. 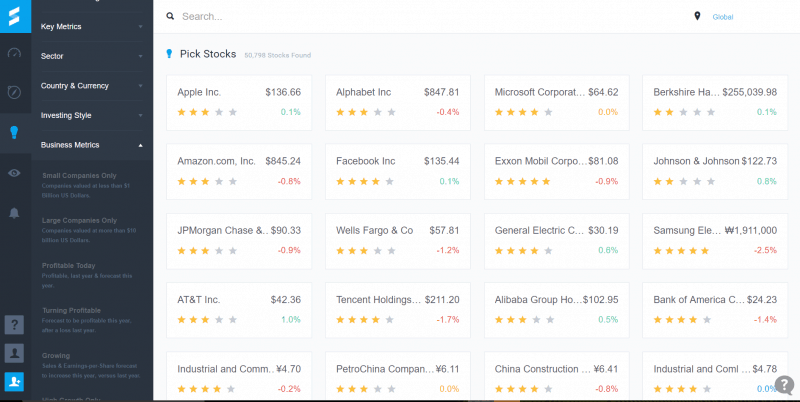 Some screeners (like Yahoo and Finviz) will give you the option to save your searches. Some will have several preset ones that you can use without having to change anything. The layouts are different, too, so use as many as you can and decide which one suits you best. 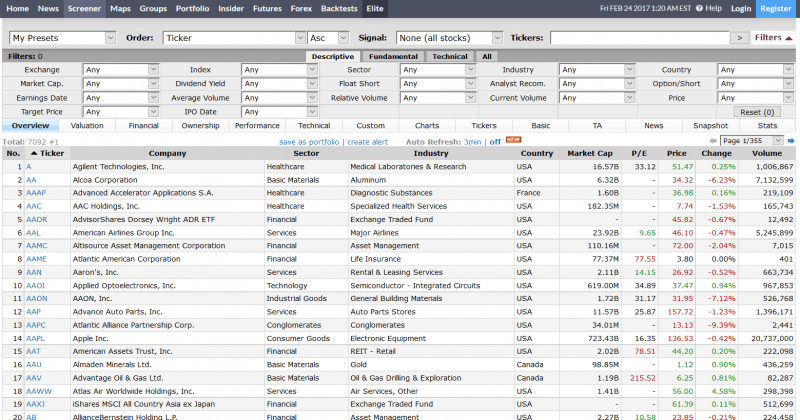 Screeners simply return a list of stocks that currently match your query. There is no magic formula to determine which of these stocks is the best, and only using screening criteria will probably not net you much profit. If that were the case, every investor would do it and there would be perfect efficiency in the market. That clearly isn’t true. 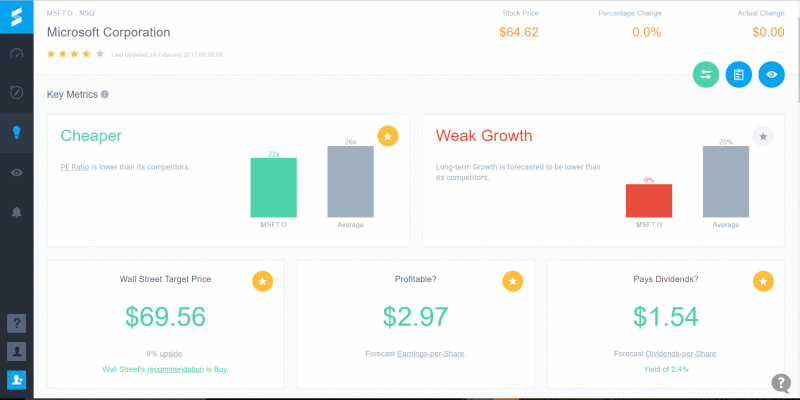 Here we will be looking at the popular ones such as Google, Yahoo, and FinViz (which stands for Financial Visualizations), and the relative newcomers Stockopedia and Stockflare. If you already have a broker, your broker might offer a better one. If not, these are a great way to start. The Google screener is, similarly to their website, very clean. It preloads with four criteria, and each has a slider superimposed over a histogram of the values available. They default to include the entire range, so you can see the top and bottom of each criterion, too. To add new ones, you can simply click “add criteria”. The criteria are neatly organised into their respective categories, and it is easy to add or remove depending on your needs. Yahoo offers more filtering criteria than Google, and their interface is busier. There are 5 preloaded criteria, but you can add and delete these. The others are not as neatly organised as Google, but there are quite a few more. They’re almost entirely grouped simply into “Key Statistics” without much differentiation. They have a lot of financials- and fundamentals-focused options. The number of stocks in their database that currently match your criteria is displayed prominently, so you can easily narrow down your search (screens with 500 results are not very useful because there’s way too much information for you to sift through). Yahoo also lets you screen mutual funds, though there are not nearly as many available filtering options. Yahoo also offers several popular preset screens, which let you immediately access commonly implemented screens. 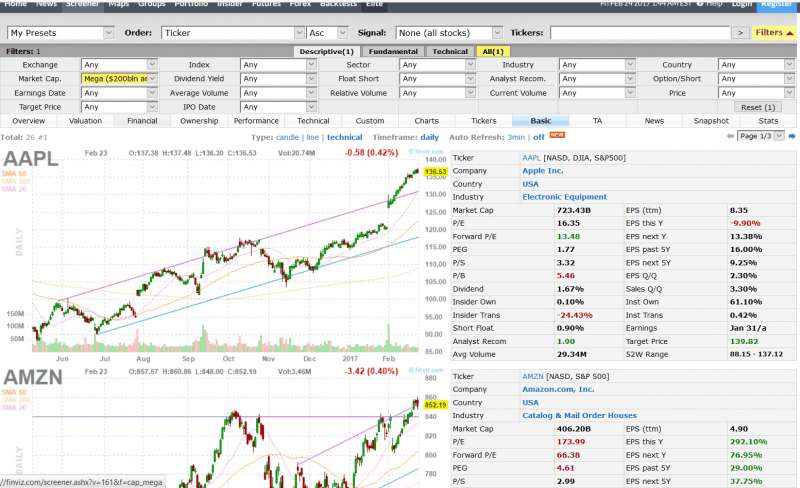 The FinViz main page is more daunting, as there is already a LOT of information on the page. The criteria are already all set to include all stocks in the database, so you end up with a full list. They also don’t have any screening criteria hidden, so what you see from the beginning is what you get. You can even click on the “all” tab to see all the screening options on one dashboard. It is not as clean as the other two, but once you get accustomed to the layout, it has its advantages. Preset views. 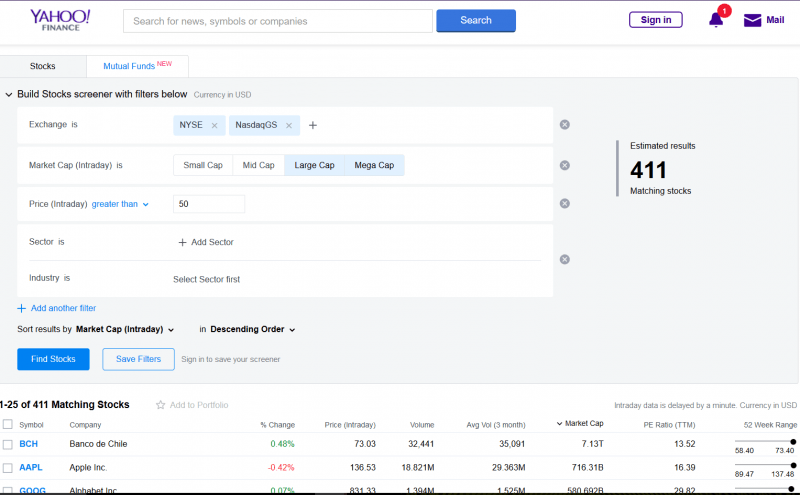 Google and Yahoo both spit out a list of stocks with your criteria attached, but only FinViz lets you look at grouped criteria and hide others. It even has a charts page and a cool little ticker page that just displays all the stocks as tickers. Visualisation: As the name suggests, the site offers a lot of visualisation. Those aforementioned tickers are all coloured and sized, so you can easily pick out large caps or heavy losers. They also have charts available right on the main screen without going to each individual stock. This is a relatively new player on the scene, coming from the London FinTech scene. They have a very user-friendly, smooth interface. They also have a very different approach to screening. You don’t have to make calculations and look at numbers. You choose filters that are more qualitative, and they do the calculations behind the scenes. Hence, you have criteria like “Turning Profitable” (made losses last year and expected to make gains this year) and “Hated by Wall Street”, where the forecast is lower than the current price. They still have some common metrics like PE and Price to Sales, but their approach is focused on being accessible to the investing illiterate. This means it is great for those just getting into investing, and those who are not interested in pursuing highly technical investment strategies. They also list some foreign stocks (not available on Yahoo), but their breadth of markets is limited to only a handful of the largest markets. Once you’ve filtered some stocks to your liking, you are greeted with a rather clean, refined layout of the main numbers. If you don’t want to pore through all the number-intensive balance sheets, income statements, and other fundamental news, this may be the screener for you. It gives you just enough to decide if you want to pursue the investment further. This screener is very helpful for beginners and those uninterested in the numbers-heavy aspects of finance. This screener boasts both preset screens and a plethora of screening options. They have over 350 financial ratios for you to choose from. One difference here is that Stockopedia is not free for public use. You can try it out for free, but you do have to pay for it eventually. Since it isn’t free, though, you do get a lot of calculations you would otherwise have to do yourself. With an account, you can, of course, save your screens and then get alerts on which stocks have qualified for your screener before the market opens that day. It may be a worthwhile subscription for active investors and traders. Disclosure: CityFALCON has an affiliate relationship with Stockopedia, and users can get 25% off annual subscriptions. See discounted prices here. Please note that even where we have affiliate partnerships, our reviews are unbiased. Some of those filtering criteria include spreads (the difference between bid and ask prices), broker consensus, and cash flows. They have good visualisations, too, if you don’t like to look at the numbers directly. Everything is coloured, so you can simply glance at the information. They also offer a global view, so you can search other markets if you want to go international. Their reports give you industry and market comparisons side-by-side, which is very helpful. You can even get PEGs next to each other. Another attractive feature of their reports is the financial indicators that are much less straightforward. These include the Piotroski F-Score and a Bankruptcy Risk indicator. If you don’t have the time or knowhow to calculate these, you can have them calculated for you. This is probably the single most beneficial feature of the service overall. They even have an indicator for “earnings manipulation risks”. What you filter is highly dependent on the type of trading or investing you want to do. This is why a good, self-developed tracker in Excel is a great idea, even for long-term traders. But that’s the last section. Here, let’s talk about most common things people like to filter for. Market Cap: useful for filtering out the tiny guys or staying away from massive firms that are too big to move rapidly. Price: filter out the pennies. Often brokers will charge you extra for stocks under a certain price threshold, too, so you can knock those out here. Volume: as a value investor, this isn’t as big of a concern as it is for higher frequency traders, but you still don’t want to get trapped in a stock that barely trades. 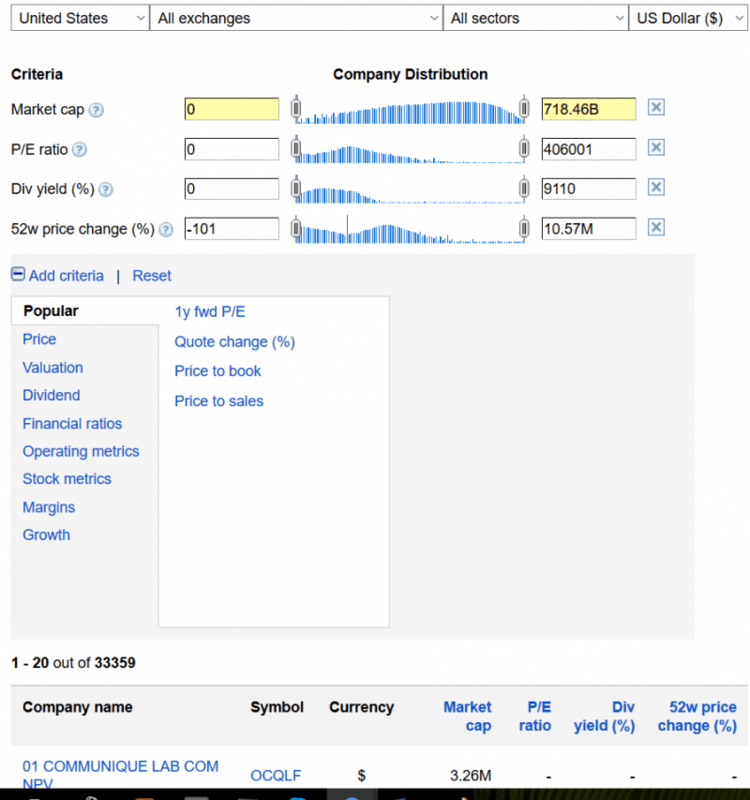 PE Ratio: one of the most important, it looks at the price of the shares to earnings; make sure to compare intra-industries, because different industries tend to have different appetites for risk. 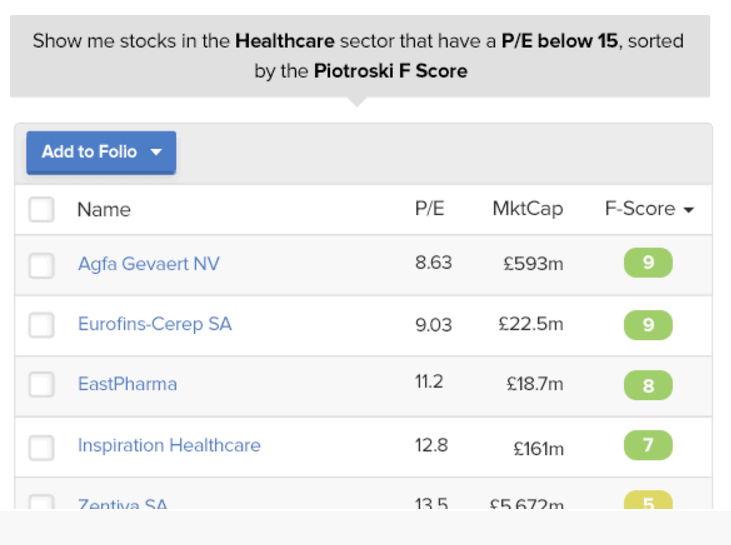 The lower the PE ratio to the industry, the better for value. Earnings Yield: the inverse (1/x) of the PE ratio, this number gives an indication of how much earnings the company generates relative to the price of the share. You may prefer this for conceptual purposes, but it is exactly the same as PE, just on the opposite side of one. PEG Ratio: price/earnings to growth may be a better forward indicator, as it takes the future into account. The only problem with forward ratios is that the future is not absolutely known, so if you see red flags but a good PEG ratio, don’t discount those red flags. You want a lower PEG ratio. Also, remember, when screening you are using the screener’s database, which may include analysts with whom you disagree. There are plenty of others, but these tend to be the ones everyone includes. Earnings dates are good to track, especially if you’re a swing trader that likes to ride the pre-earnings wave. Dividend yields are also good for long-term guys because it can be a good indication of a highly profitable operation (or it could be the leftovers of a good operation, and it has now become a warning). Knowing the short interest is helpful for insight into the market’s attitude towards the stock. Everyone needs to screen stocks. Even if you don’t use a screener as it is commonly known, you at least have a few stocks in mind. You’ve probably screened out others based on your knowledge or your contacts. Once you’ve screened, though, there is plenty more work to be done. Screeners deal largely with numbers. You can screen for fundamentals, which will significantly help you cut down on the stocks. If you like to see high cash from operations coupled with low debt-to-equity, you can screen for it. You can also screen for some qualitative criteria, like country and exchange. However, investing is not solely numbers. Screeners can only take you so far. Once you’ve narrowed down your results by prudent screening of financials (and technicals, if that’s your thing), you need to delve into less quantifiable aspects. Look at who’s buying if you can. The SEC in the US requires insiders to disclose most transactions within two days, so you can easily find out what the people with all the information are doing. Look at the product line. Is it likely to be profitable in 5 years? Are there any foreseeable problems with production? How about legal action or political risk? Supply chains in the globalised world are long. Don’t get stuck with a losing stock because you didn’t understand how your pick sourced material from a single mine in an environmentally-sensitive area. What about the people? Do you trust the people in charge? Do they have good track records (anyone with a positive record will talk about it)? What about investors you know? What do they say about picks? There’s seemingly endless data out there, and screeners are a great way to filter out the noise and look for stocks you really want. Don’t be overzealous in the criteria, or you won’t get any results. But don’t be too broad, or you will be spending 25 hours a day reading through huge amounts of information that is largely impertinent to your strategy – and no, that’s not a typo. Finally, don’t forget you need to look at things not available through screeners. 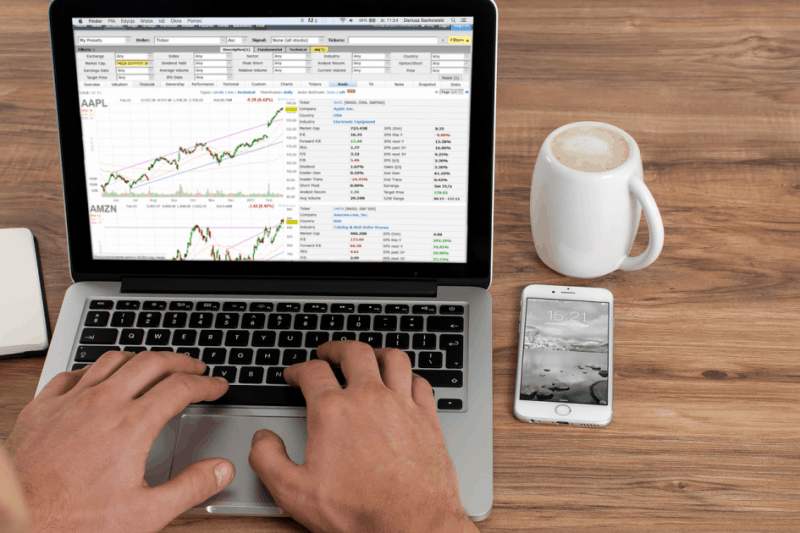 At CityFALCON, we help investors and traders track fundamental news on stocks, commodities, foreign exchange, private companies, financial topics, and more. Once you identify the stocks that you’re interested in, you could track news and data over the next few months until you’re more positive on your fundamental thesis and could start building your long term portfolio. Using freely available screeners is great, but if you want to have a truly effective system, I suggest creating some models. You can scrape data from the web very easily (but make sure it’s legal and you’re not violating the terms of the website), and many sites offer APIs that will throw a giant string at you that you can easily parse. Microsoft’s Office Suite has its own coding language associated with it, and it works very well with Excel. It is called Visual Basic for Applications (VBA). With APIs, you can use any language, though you might have to design a GUI if you want that functionality, and Excel provides a great one already. I am also most familiar with Excel for financial applications, so it was natural for me to learn VBA. The biggest advantage to having your own models is you know exactly what you want. Publicly available screeners aren’t going to collect data on oil reserves announcements, but your model can. After you have that information, you can start making interesting comparisons not available to everyone. Therein lies your edge on the market. Do others have this information and are acting on it? Sure, but you’ll be way ahead of the average investor in the market. Whether you will use Excel and VBA or something else, I strongly recommend building your own models and learning some programming to automate the process of data collection and screening. It will help you build out your strategy and can only benefit you. If you want fundamental news, you could also access financial news data through the API from CityFALCON; see more info here. Which screener to use is up to you. You may like one not listed here. Try as many as you can. That is the only way to get the best one for your trading style and your ease of use requirements. If you need help, FinViz and Google offer up blurbs about what each criterion actually means. At most times, the free screeners might be good enough, but if you want a very sophisticated platform, try out Stockopedia. MarketXLS is great for this. It works for me.